94 pages. Illustrated in color throughout. Hardcover. Published on the occasion of the exhibition David Salle: Paintings 1985-1995 at Skarstedt, New York, this catalogue features full plate images, details, and installation photographs, as well as an essay by critic Deborah Solomon. The exhibition brought together works from many of Salle's most significant bodies of work. 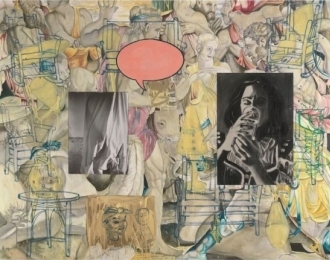 A celebrated master of postmodern painting, David Salle is known for his deconstruction of images through his use of photography, collage, and his uncanny compositional instinct. With the return of painting in the 1980s simultaneous to the rise of the “Pictures Generation”, Salle became a bridge between these two techniques and ideologies, but also extending, in his own way, the contentious legacies of Abstract Expressionism and Pop Art.